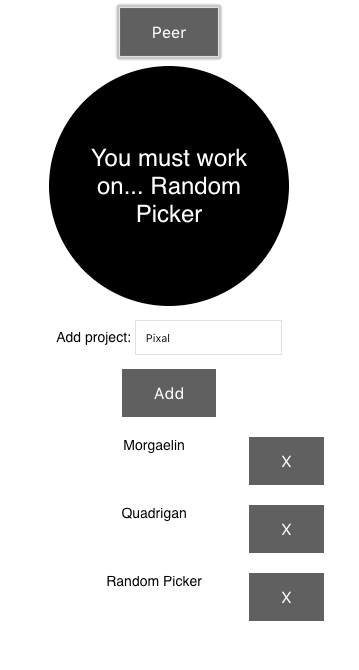 I’ve updated Project Picker to use riotControl to handle all actions, including moving all model management to store objects. If you are using riot in your FE, this may be useful. In order to test using multiple stores, I added a pretty useless “history” functionality which keeps track of the projects chosen by the picker. Triggered by a user action handler after gathering all required info from the tag. Handled by the stores to execute actions. Triggered by a command action handler after an action has been executed. Handled by the tags (and stores to a lesser extent) to update their model. Check the source code or see it live. I was trying to decide what project to work on, so I decided to work on a project which decides what project I should work on. A simple project made on riot.js, just getting the hang of it. Source code is here, may be useful if you are starting using it or in case you’ve got multiple projects and can’t decide what to work in, let the pseudo RNG decide… check it out here!